The Super-Speed 12-Port USB 3.0 Powered Hub is backward compatible with USB 2.0 and 1.1 specifications. It provides an out of the box industry standard that allows connection of up to twelve USB peripherals or devices to your PC or Mac USB ready host. Designed to provide quick and easy access, the USBG-12U3ML provides twelve type “A” downstream ports for connecting USB peripherals, devices, or other USB hubs. A single type “B” upstream port connects to the host computer or another USB hub, enabling up to 127 devices to be connected by cascading multiple hubs. Configured directly by the operating system, the 12-Port USB 3.0 Powered Hub operates seamlessly with both Microsoft Windows and Apple Macintosh Operating Systems. The USBG-12U3ML 12-Port USB 3.0 Powered Hub is targeted at Industrial Application users for both PC and Mac that are expanding the number of USB ports on their system. The all metal chassis provides a rugged and durable construction that can withstand operating conditions in both the Automotive and Marine industries. 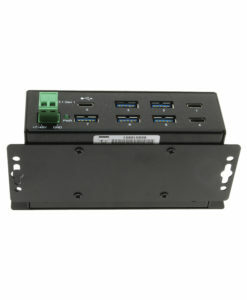 The 12-Port USB 3.0 Powered Hub can be wall-mounted or installed onto a DIN-Rail for convenient access to the port connections. 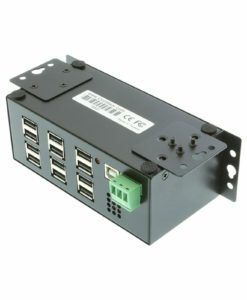 The USBG-12U3ML USB 3.0 hub can be powered with a three wire terminal block connector (7-24V) with AC Adapter Required, the AC adapter is sold separately for peripherals requiring more power consumption (pictured below). The USBG-12U3ML is a Super-Speed USB 3.0 12-port hub that is backward compatible with USB 2.0 and 1.1. It provides an out of the box industry standard that allows connection of up to 12 USB peripherals or devices to your USB ready PC or Mac. External power supplies are sold separately for the USBG-12U3ML Hub. As a standard USB hub, the USBG-12U3ML buffers USB data from any attached peripheral in compliance with USB specifications to provide an invisible extension of the USB bus. Supporting both low speed (1.5Mbps and 12Mbps), Hi-Speed (480Mbps), & Super-Speed (5,000 Mbps) devices, each port creates a bridge between the peripheral and host computer.